All summer I was getting emails from my dear friend Janet. She lives in a small town in Mexico called Tepoztlan. It’s beautiful, mountainous, and very ancient. The indigenous Tepoztecans don’t consider anyone native unless their family has been there for several hundred years. For many years, Tepoztlan has been the weekend retreat for Mexico City’s well-heeled residents. I met Janet when she and her husband Doug were in DC for a couple of years. 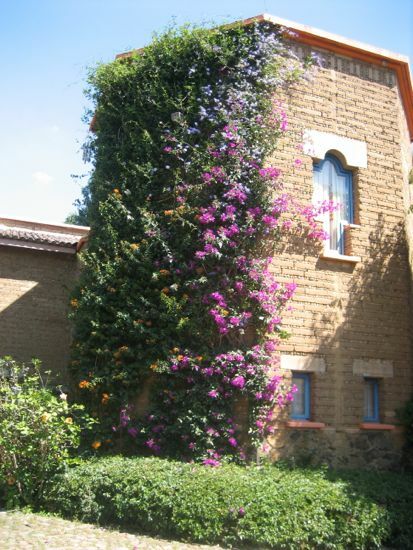 They became landscape clients, then dear friends. They had a lifetime of moves from Miami to London, Toronto to Mexico City, and when they decided to retire, it was Tepoztlan that called to them. And I understand why. It’s lovely and there are so many ex-pats living there from all around the world, drawn by the artistic nature of the place. Painters, writers, film-makers all seem to gather under the pyramid. Dennis and I have visited several times and I was always ready to go back, but Dennis thinks of vacations as an opportunity to explore new places, so four years have passed since I last was there. And then this summer, Janet’s friend Magda developed an idea. Magda offers culinary and writing workshops, and Betty Fussell was renting Janet’s house, and somehow, the Under the Volcano writing workshop was imagined. My email was bombarded as both Janet and Betty encouraged me to attend. It wasn’t a difficult Yes, and Dennis understood how this could be a good thing for me, so plans were made. Tepoztlan is magical. The zocalo – market – is bustling. There are piles of chiles, astonishing produce, local women making tortillas, fresh and hot. I learned so much about traditional Mexican cooking when staying with Janet. We would shop the market every day, return and cook for hours. The avocados! The oranges! The moles! The tamales! Seriously, I can taste them all, still, they were so fresh and so different than my previous experiences with Mexican food. Tere, Janet’s talented kitchen helper, showed me how to make the most spectacular breakfast – so wonderful I had to share it immediately and posted it on Food52. Hidden Eggs. It takes some practice, but seriously, these are some amazing eggs. Time is inconsequential in these hills, so it’s likely this apertif will last two or more hours, while lunch is being prepared. Everyone’s pretty happy by then. And starving. And then out come steaming bowls of mole, of beans, glorious rice, chile spiked dishes you’ve never even imagined. It gets loud and there is a lot of laughter. This is how I think of Tepoz – food, laughter and new, fascinating friends from all around the world. So why am I choosing this gloomy cold October day to tell you about sunny, warm Mexico? 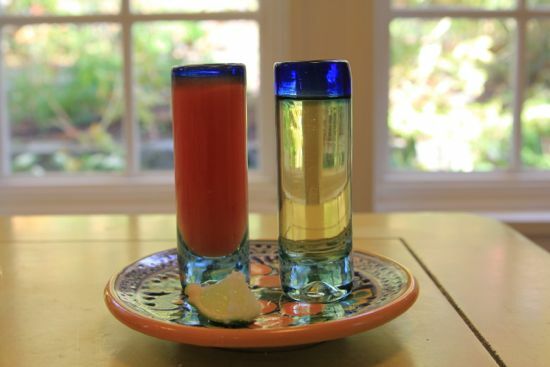 Because my dear friends at Food52 are featuring Under the Volcano, and Tepoztlan. Go to the site and you’ll see a wonderful writing workshop with Magda, with Betty Fussell and even a guest appearance by Janet (the most amazing lecturer on the art of Mexico.) I have it on good authority that Janet will be hosting a lunch for the group, and that’s worth WALKING to Tepoztlan. There are only a few more days to jump on this opportunity. I’m planning to be there and hope you will think of coming, too. 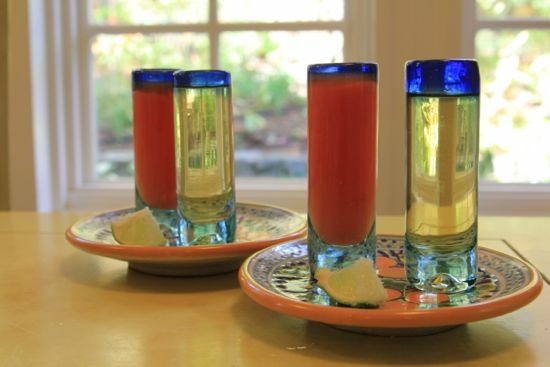 In the meantime, here’s the Sangrita recipe. If you don’t have these cute glasses and plates, don’t worry. They are easy to find in Tepoztlan. Drop whole tomatoes into a pot of boiling water for three minutes. Fish the tomatoes out and set them aside until cool enough to touch. Core the tomatoes and put them in a blender to puree. Press through a sieve. Combine the orange, lime and tomato juices. Grate in the onion. Add the chile and salt. Stir well and chill for an hour. 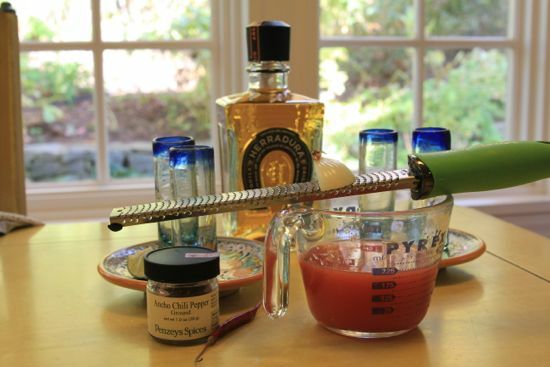 Serve side by side with your favorite excellent tequila. Garnish with a dash of chile and a wedge of lime dipped in salt. PS A little apple polishing — check out this lovely announcement of my book deal in the Washington Post, and a wonderful profile by the talented China Millman in the Pittsburgh Post Gazette. 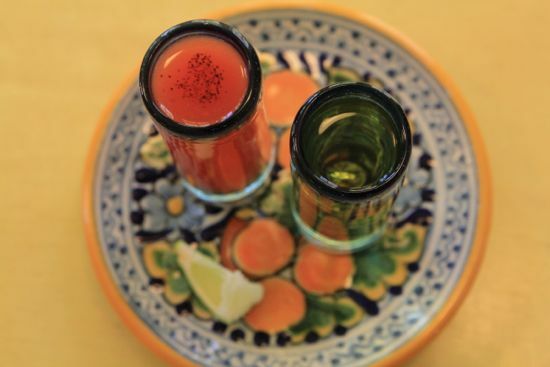 You’ve made your friend’s little corner of Mexico hard to resist:) And the Sangrita even more so. Well, if we can’t make it to Tepotzlan, at least we have Sangrita (and/or tequila) to get the little blood flowing 😉 Although this writing workshop does sound deliciously inspiring. Thanks for the introduction to it! Wow, talk about a memory flash! 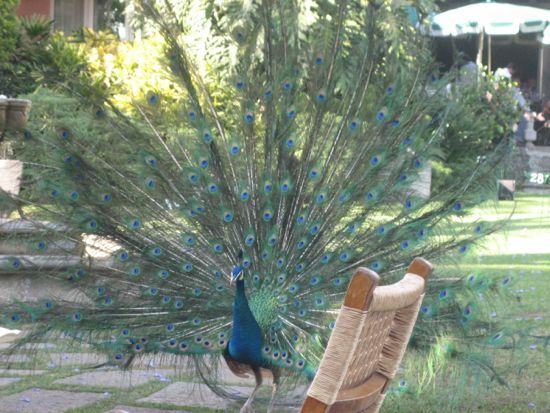 I am betting that the chair in the foreground of the peacock photo is like some chairs my folks had in their living room when I was growing up. The chairs were fairly low to the ground, and could fold up, and it was hilarious watching my parents’ friends attempt to get out of them at parties. It sounds like a wonderful time there. Hi! I will be seeing you in Tepoztlan!! This post makes me even more excited about exploring this gorgeous, ancient mountain town. I have been following your blog for some time since every recipe I want to make on Food52 seems to be yours. And because I am giving myself a crash course in canning this winter, and you have much to offer on that topic. 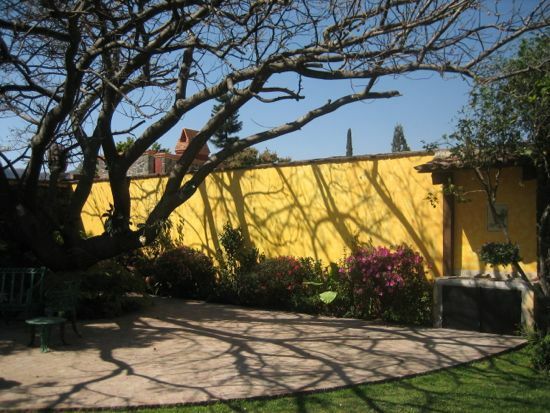 Can’t wait to connect over food, writing, and laughter in Tepoztlan.